Gilbert Holiday was born in London, son of Sir Frederick Holiday, ICS. He was also the nephew of Henry Holiday, a well known stained glass designer. When he was a boy Gilbert lived in St. John's Wood, Hampstead, and it was here, when watching the Royal Horse Artillery from his bedroom window, he first realized his fascination and love of horses. After studying at the Royal Academy Schools he went on to work as an illustrator at The Graphic, The Tatler and The Illustrated London News. This career was cut short by the First World War and it was of no coincidence, considering his early encounters with the Royal Artillery, that he served as a gunner in the Royal Field Artillery on the Western Front. After the War had ended, Holiday's love of horses continued to influence his life. 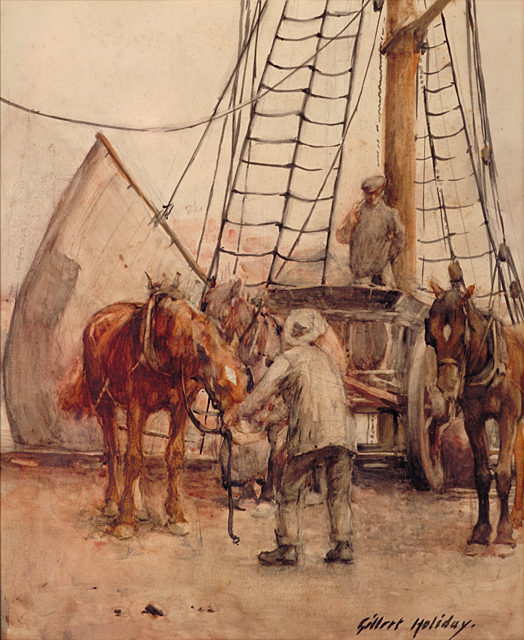 He became a well respected equine artist as well as a keen horseman, painting almost every known equestrian sport as well as working horses, as can be seen in this months 'Artwork of the Month'. "no one can, or ever could, paint a horse in action better than Gilbert could." Unfortunately his love of horse eventually led to his death, which followed a bad accident while out hunting.